Watson (appendix) is drawing interest from ESPN for a job on television, Michael McCarthy of The Sporting News reports. Watson (illness) is listed as inactive Sunday against the Rams, Nick Underhill of The New Orleans Advocate reports. Watson is officially listed as questionable for Sunday's NFC Championship Game versus the Rams. However, he isn't expected to play due to appendicitis, Katherine Terrell of ESPN.com reports. Watson will be held out of Sunday's NFC Championship Game against the Rams due to appendicitis, Katherine Terrell of ESPN.com reports. Analysis: Watson kicked off the week with back-to-back absences as a result of an illness, which now has been clarified. So far, he's sidestepped surgery, but the situation is severe enough for the veteran to be ruled out well in advance of Sunday's contest. Watson has declared his intention to retire after this season, so a Saints loss Sunday would put an end to a 15-year career. Expect Josh Hill, Garrett Griffin and Dan Arnold to hold down the fort at tight end this weekend. Watson (illness) didn't practice Thursday, Josh Katzenstein of The New Orleans Times-Picayune reports. Analysis: Watson has played second fiddle to fellow tight end Josh Hill in terms of offensive snap count for most of the campaign. That said, Watson is the superior receiving option, especially in the red zone, so his status will be one to monitor in advance of Sunday's NFC Championship Game against the Rams. Friday's injury report will provide the final word on his potential to suit up. Watson was listed as a non-participant on Wednesday's injury report due to an illness, Mike Triplett of ESPN.com reports. Analysis: Since his intention to retire after the season came to light in late December, Watson likely will take every measure to play during the Saints' postseason run. As a result, an appearance at practice Thursday or Friday may not be mandatory for the veteran tight end to take the field for Sunday's NFC Championship Game versus the Rams. Watson said Thursday that he's planning on retiring after the 2019 season, Josh Katzenstein of The New Orleans Times-Picayune reports. Watson caught one of his two targets for a six-yard gain during Sunday's 31-28 win over Pittsburgh. Watson caught one of two targets for 28 yards during Monday's 12-9 win over Carolina. Watson caught three passes for 24 yards in Sunday's win against the Buccaneers. Analysis: It has been an extremely quiet second half of the season for Watson, who has just eight total catches over his last seven contests. In fact, Watson's modest 24 receiving yards were his most since Week 9. 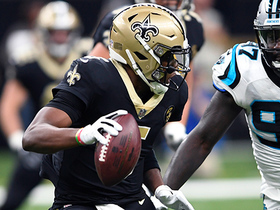 While potential touchdowns are always on the table in the Saints' typically high-scoring offense, Watson simply has not done enough to warrant every-week consideration in most fantasy leagues, even given the ugly state at tight end. Watson pulled in one of two targets for 20 yards during the Saints' 31-17 Thanksgiving win over Atlanta. Watson had one catch for one yard in Sunday's win against the Bengals. Watson caught three of four targets for 62 yards and a touchdown during Sunday's 45-35 win over the Rams. Analysis: Watson didn't see many targets, but he averaged a healthy 20.7 yards per reception as he finished second on the team in receiving. He made an especially nifty 32-yard catch to set up a touchdown in the second quarter and added a 13-yard score of his own just before halftime. This was a nice bounce-back performance for Watson after he was held without a catch last week, but his role remains heavily dependent on game flow. He'll look to build on this effort next Sunday against the Bengals. Watson was not targeted in Sunday night's win against the Vikings. Watson caught all six of his targets for 43 yards and a touchdown during Sunday's 24-23 win over the Ravens. Watson caught all four of his targets for 30 yards in Monday night's win against the Redskins. Watson caught one pass on three targets for 23 yards in Sunday's win against the Giants. Analysis: Watson again split snaps fairly evenly with Josh Hill -- 37 snaps for Watson compared to 43 snaps for Hill -- though it was Hill who had the bigger statistical output, hauling in all three of his targets for 63 yards. Nevertheless, Hill is primarily used as a blocker in the Saints offense, so Watson should remain the preferred tight-end receiving option. The veteran is a back-end starting option in many fantasy leagues. Watson caught five of six targets for 71 yards in Sunday's 43-37 overtime win over the Falcons. Analysis: Watson finished a distant third in receiving yards behind Michael Thomas and Alvin Kamara, both of whom topped 120. Still, this was a big step in the right direction after he totaled just 63 yards in Weeks 1 and 2 combined. The veteran tight end will look to build on this performance next week against the Giants. Watson had three catches on five targets for 19 yards in Sunday's win against the Browns. Analysis: The Saints' starting tight end played 54 of the team's 66 offensive snaps, but mustered little production. 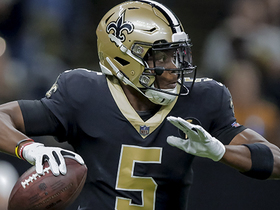 That said, Watson was one of only four Saints who saw more than one target and he should have had a bigger day, as quarterback Drew Brees overthrew him on what would have been a wide-open two-yard touchdown in the first quarter. Watson remains a decent, albeit unexciting, starting option at tight end in many fantasy leagues. Watson caught four passes for 44 yards in Sunday's loss to the Buccaneers. Analysis: Watson significantly outsnapped backup tight end Josh Hill -- 51 offensive snaps compared to 24 -- and his 4 for 44 stat line is probably a reasonable expectation for the 37-year old veteran. Watson should remain a solid, albeit unexciting, option at tight end in many fantasy leagues. Watson wasn't present at Thursday's practice, Luke Johnson of The New Orleans Times-Picayune reports. Analysis: Watson's absence from the final practice before Saturday's exhibition versus the Chargers is an ominous sign for his availability. In the end, though, the Saints should clarify the status of their starting tight end, whether he's dealing with an injury, a personal matter or something else. Once the regular season rolls around, he'll be aiming to replicate his 74-825-6 line from his previous stint with the Saints in 2015. Watson could be utilized as a downfield receiver this season, Josh Katzenstein of The New Orleans Times-Picayune reports. Watson started Friday's preseason game against the Cardinals, but he didn't draw any targets on 18 snaps. Analysis: After missing the first week of the preseason with an undisclosed injury, Watson returned to practice last weekend and proved his health Friday night. He figures to get plenty of snaps on a team without much talent at his position, but it would be unwise to expect a reprisal of his 2015 target count (109) from his last stint with the Saints. In addition to being three years older, Watson is now part of a far more balanced team. Watson (undisclosed) returned to practice Saturday, Joel A. Erickson of The Baton Rouge Advocate reports. Analysis: Watson suffered the undisclosed issue during Monday's practice, but the veteran tight end appears to have avoided anything serious in this case. After a one-year stop in Baltimore, the 37-year-old tight end is expected to head his position group again in New Orleans this season, with Josh Hill and Michael Hoomanawanui serving as his primary backup options. Watson appeared to suffer an injury during Monday's practice, Luke Johnson of The New Orleans Times-Picayune reports. Analysis: Watson was removed from the first practice of the week with a member of the training staff at his side. 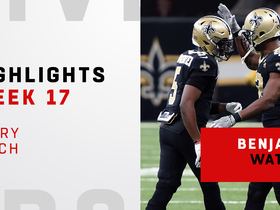 While the Saints have yet to comment on the injury, the 37-year-old tight end was held out again Wednesday. Josh Hill and Michael Hoomanawanui (undisclosed) have been working with the first-team offense in Watson's absence. Watson agreed Wednesday with the Saints on a one-year deal, Adam Schefter of ESPN reports. Watson visited with the Saints on Tuesday, Herbie Teope of The Times-Picayune reports. Watson visited with the Chiefs this week, Ian Rapoport of NFL Network reports. Watson caught seven of 10 targets for 61 yards in Sunday's season-ending loss to the Bengals. Analysis: Watson was once again the safety blanket for quarterback Joe Flacco, and had 16 receptions for 175 yards and a touchdown over the final three games of the season, ending the season as the Ravens' second-leading receiver (61 catches for 522 yards). The 37-year-old will enter free agency in 2018 after missing the entirety of 2016 with a torn Achilles, and retirement seems like a definite consideration, although no announcement has been made one way or the other. Watson caught five of six targets for 40 yards in Saturday's win over the Colts. Analysis: The veteran tight end turned in another solid performance in Week 16 and has now recorded multiple receptions in four of his last five games. Watson's 54 receptions on the year tie him with Seattle's Jimmy Graham for ninth in the league among tight ends. Obviously, Watson's touchdown production hasn't been in the same stratosphere as Graham's, but Watson does have some sneaky utility in PPR leagues that play into Week 17. Watson caught all four of his targets for 74 yards and a touchdown in Sunday's 27-10 win over the Browns. Analysis: Watson came into the game with a meager average of 7.7 yards per reception, and he failed to catch a pass the previous week in a 39-38 loss to the Steelers. His unexpected outburst primarily was fueled by a 33-yard touchdown, but he also had gains of 18 and 14 yards, accounting for three of his 10 longest receptions this season. Watson gets another favorable matchup Week 16 against the Colts, though his track record this season remains far from encouraging. Watson was not targeted during Sunday's 39-38 loss to Pittsburgh. Watson caught three of five targets for 24 yards and a touchdown in Sunday's win over the Lions. Watson snagged all three of his targets for 29 yards in Monday's 23-16 win over Houston. Analysis: It was the fourth time this season that Watson caught every pass that has come his way. The veteran tight end gets plenty of work, 41 snaps on Monday, as a backup in Baltimore's ball-control offense, but the numbers haven't been there. Watson hasn't topped 45 yards receiving since Week 2 and has scored just once since Week 3. His talents don't shine as bright in Baltimore's last-place pass offense. Watson caught his lone target for a 33-yard gain in Sunday's 23-0 win over the Packers. Watson caught seven of 10 targets for 41 yards in Sunday's loss to the Titans. Analysis: The 10 targets were a season-high, but Watson still had a low yardage output. According to airyards.com, Watson's average depth of target is just 6.90 yards downfield, which is a low mark that confirms that he is rarely running the type of routes that lead to big plays. Watson remains a staple of the offense, but Baltimore's hesitance to use the veteran beyond check down-type routes puts a cap on his yardage output. 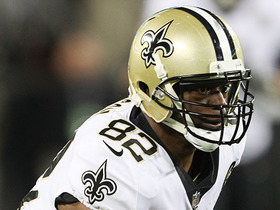 NFL Network Insider Ian Rapoport has the latest on New Orleans Saints tight end Benjamin Watson. 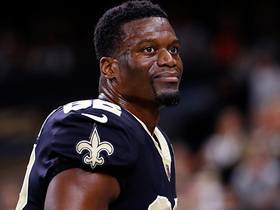 NFL Network Insider Ian Rapoport reports on tight end Benjamin Watson is likely to miss NFC title game. 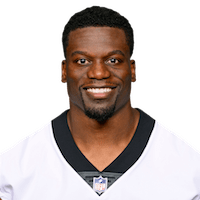 New Orleans Saints tight end Benjamin Watson wraps up his final regular season game with two catches in a 33-14 loss to the Carolina Panthers in Week 17 of 2018. 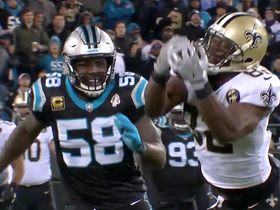 New Orleans Saints quarterback Teddy Bridgewater avoids a sack and tosses a pass to tight end Benjamin Watson for a first down. 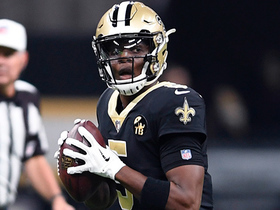 New Orleans Saints quarterback Teddy Bridgewater rolls to his left and throws a dart to tight end Benjamin Watson for 18 yards. 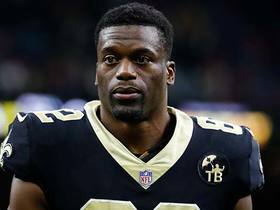 New Orleans Saints tight end Benjamin Watson announces he will retire after the 2018 season. 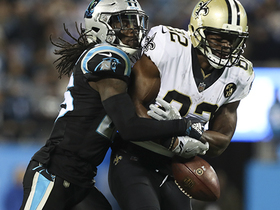 Carolina Panthers cornerback Donte Jackson is able to break up the catch from New Orleans Saints tight end Benjamin Watson. 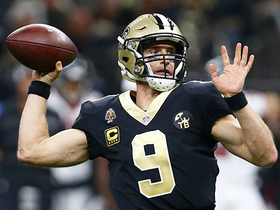 New Orleans Saints quarterback Drew Brees passes 28 yards to tight end Benjamin Watson. New Orleans Saints quarterback Drew Brees drops a perfect pass to tight end Benjamin Watson for a 20-yard gain.